In a month of special commemorative dates, the Living Amazon Initiative celebrates the importance of freshwater ecosystems and the conservation of Amazon fish species. May 24 probably does not mean much to you at first sight; not yet anyway. We would like to change that because in fact it happens to be World Fish Migration Day and to celebrate the moment WWF’s Living Amazon Initiative is unfolding a series of activities throughout the month of May to underscore the urgent need to preserve freshwater ecosystems and aquatic species, especially the Amazon’s migratory fish species. Under a partnership arrangement among WWF, the Nature Conservancy and other organizations known as worldfishmigrationday.com, this movement seeks to show society how relevant and important migratory fish species are all over the world. In the Amazon, the situation is no different. The free migration of species is of fundamental importance to maintaining fishery stocks in the region. 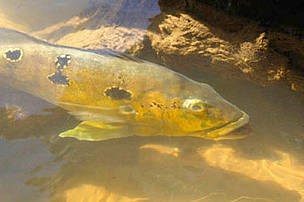 Species such as the Dourada, the Laulao, the Piraiba, the Jau, the Sorubims and the red-tailed catfish and scaled (bony) fish species like the Matrinsham, the Black Pacu, the Peacock Bass and the Red-bellied Pacu as well as cetaceous species like the river dolphins and reptile species like the turtles undertake journeys of thousands of kilometres to spawn, mate and reproduce and to search for new feeding grounds according to the rise and fall of the waters. If they are unable to migrate their populations suffer and may even collapse entirely. Healthy rivers do more than just ensure the biological diversity of freshwater systems, they play a vital role in maintaining the equilibrium of food chains and of the forests; the forests in turn provide a series of ecological services essential to the existence of life on Earth. Interrupting the natural migratory cycles of the fish will also have a direct effect on entire Amazonian communities that depend on artisanal fishing to feed their families and obtain an income. We have no built so many artificial barriers in the rivers that we are generating a serious decline in migratory fish species all over the world and in the Amazon in particular. For all those reasons, the Living Amazon Initiative is celebrating and proclaiming the importance of freshwater ecosystems and of the Amazon region species in this month of May with commemorative dates, research work and communication dedicated to the theme. To pay our homage to Amazonian migratory fish species we are presenting information and curious facts about species that swim for thousands of kilometres in the rivers of the countries that share parts of the Amazon biome. We will be launching an animated feature to be used in the Web and Facebook. In it we will accompany the journey upstream of a fish as it faces natural challenges and others imposed by human beings in its endeavour to meet its needs to find feeding grounds, to spawn and to reproduce. Based on origami language, the feature will enable any age group to understand the overriding need to preserve freshwater ecosystems. This important joint action is being undertaken by the WWF Living Amazon Initiative, WWF Brazil and the Mapsmut organisation and is designed to glean information on fish species in the Juruena River. The objectives are twofold: electronic registration and remote tracking of large individuals by tagging them with chips and a survey of all fishing activities in the area. Find out more at our expedition webpage. Distribution: Occurs in the Amazon and in the Orinoco River Basins but has been introduced to places in Central America and countries such as Hawaii, Taiwan, Indonesia and China. Characteristics: The large black pacu or tambaqui can be over 90 cm long, weigh up to 30 kg and is long lived; up to 70 years. The fish has a dark color and an oval shape. Migration takes place at the end of the rainy season when mature individuals move upstream to spawn. 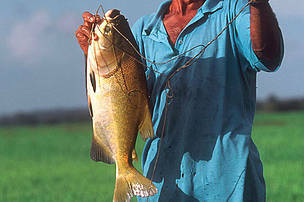 In the Amazon River Basin, the black pacu is highly sought after by subsistence fishermen. They also contribute to the commercial fish harvest in the lower Amazon and are raised in aquaculture facilities. 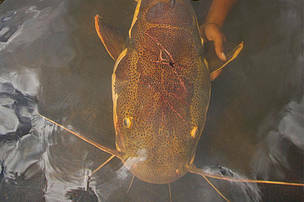 Migration: These catfish species spawn during the high water period in mountain tributaries. The cool temperature supposedly postpones hatching and eggs are drifted downstream faster because of the high rate of flow in the streams. Characteristics: Their preferred habitat is slow moving water. It is a sedentary, carnivorous species with territorial behavior. 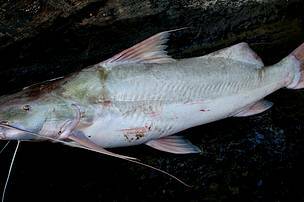 Characteristics: This catfish is dark grey on top and white underneath and can be distinguished from the piraiba and other catfish by a pair of extremely long barbels. With a maximum known length of 105 cm, it occurs in the main channel of the Amazon River and its Andean and sub-Andean white water tributaries in the Brazilian, Colombian and Peruvian Amazon regions. 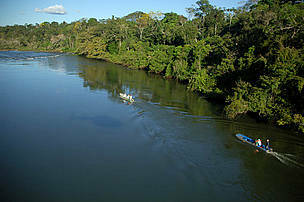 It is rarely found above rapids, with the exception of the Madeira River and the upper course of the Tocantins River. Similar to the Brachyplatystoma flavicans‘s habitats, the laulao’s preferred habitat is the channels of whitewater tributaries and it can rarely be found in the more nutrient-poor black water rives.